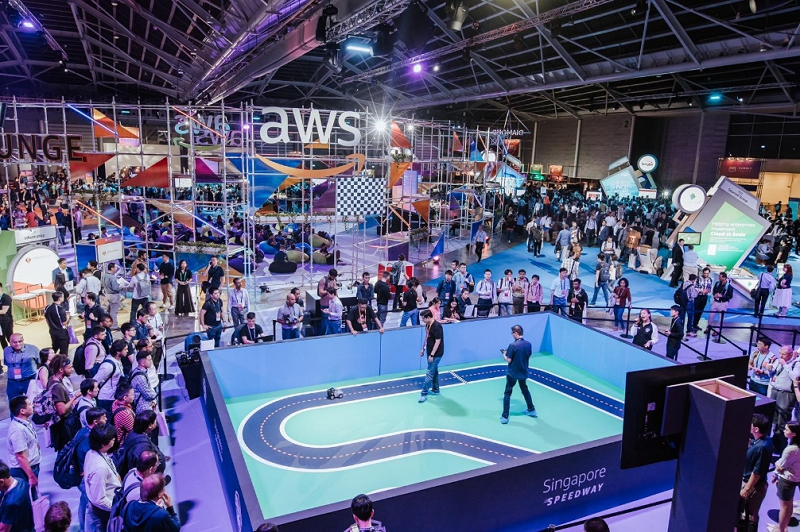 The AWS DeepRacer League, the world’s first autonomous racing league open to developers of all skill levels held a race in Singapore this week (April 10-11). This was the third of twenty races on the worldwide Summit Circuit. Following the first two races in Santa Clara, California and Paris, France, excitement was building to see what the Singapore developer community could deliver. And they sure delivered, with the Singapore Champion Juv Chan setting a new world record lap time of 9.090 seconds. In fact, the top seven lap times on the Singapore Summit leaderboard all beat the prior leaderboard top spot (which was 10.43 seconds from Chris Miller in the Santa Clara race). Nice work Singapore! 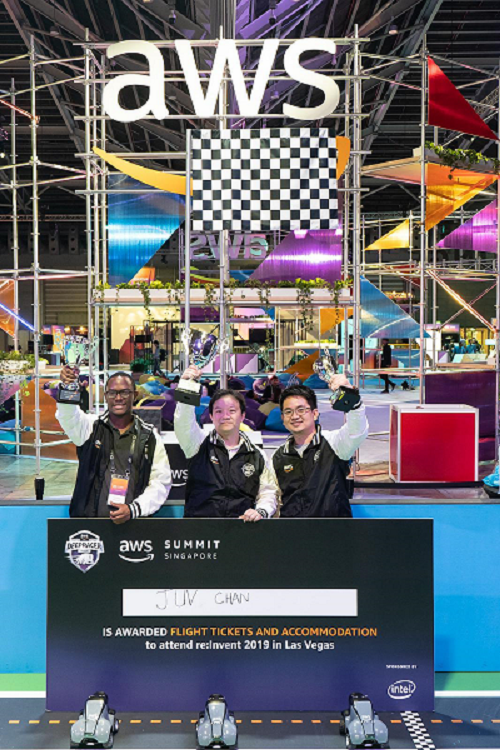 Juv Chan’s AWS DeepRacer experience started back in November 2018, “I heard about AWS DeepRacer when it was launched at re:Invent 2018 and thought that this is a very interesting way to learn RL,” he said. The moment the Singapore Summit doors opened, Juv was the first racer on the track, setting the pace with a 12.930 second lap using one of the AWS-provided sample reinforcement learning (RL) models. Getting that hands-on experience at the tracks fueled Juv’s desire to learn more, so he headed to the AWS DeepRacer workshop to dive into how to build his own custom RL model. This marked the beginning of a 24-hour learning and racing extravaganza for him! “I work as an AI developer for my job, but this is my first time exposed to RL. It’s really engaging and addictive,” said Juv. Juv went home that night determined. He wanted to learn all he could about how to optimize his model further, so he took the AWS DeepRacer: Driven by Reinforcement Learning online training, where he found more tips and tricks on how to climb the leaderboard. Next, Juv put his new knowledge to the test by tweaking hyperparameters and tuning his model, then he trained it for 12 hours to get race-ready. The competition was hot on the second day where the rubber really hit the road for Juv and his DeepRacer model. He was first on the track again and immediately took the top spot with a 10.88 second lap. But, he made no assumption that this was enough to win and headed back to his laptop to continue optimizing his model performance. He was soon knocked off as more developers came with their custom models, and lap times in the 9-10 second range were recorded. At one point in the race Juv dropped down to 10th place on the leaderboard. Juv shared the philosophy behind his approach, “Fail fast, learn from mistakes and keep trying.” With that in mind, he came back to race two more times to secure the win. And secure the win he did, with 10 minutes of race time left he threw caution to the wind with the throttle and was victorious with a winning lap time of 09.090 seconds. Congratulations Juv! Juv won a trip to compete in the AWS DeepRacer League finals at re:Invent 2019 in Las Vegas. I wonder if his 9.090 lap will still be the world record holder then? Developers, this is the time to beat! Tshiamo Rakgowa, a robotics enthusiast was the first runner-up, with a lap time of 9.420. He was followed closely by Wang Teng Lee, a software engineer with a 9.590 lap (+ 0.17 seconds back). Both of these gentlemen also tuned and raced their models multiples times, experimenting their way to top spots on the leaderboard. The similarities don’t end there. By coincidence it turns out that all three of the leading racers are connected to a town called Kepong in Malaysia. In fact, it’s Juv and Wang’s childhood home town (they live in Singapore now), and it’s where Tshiamo calls home right now. 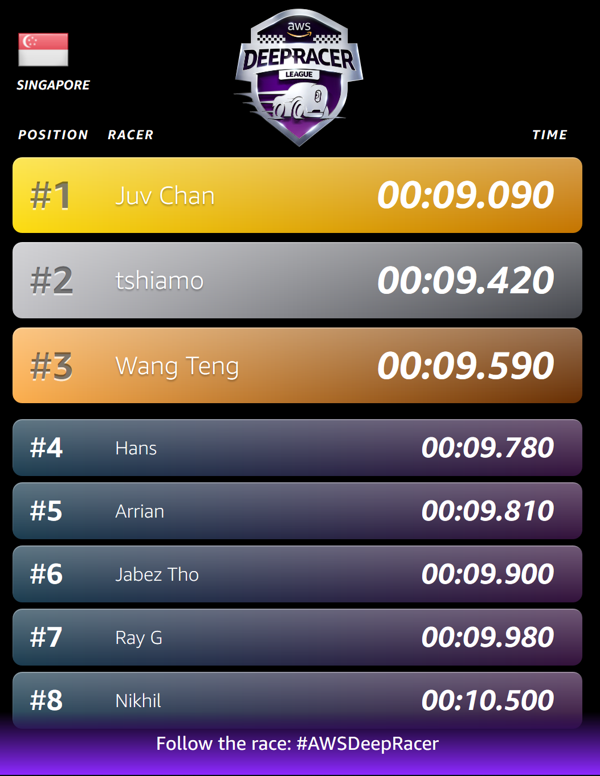 Congratulations to Tshiamo and Wang, it was a very close race! Don’t forget we still have 17 races to go with 4 in Asia, including Seoul on April 17, Tokyo and Taipei both on June 12, and Hong Kong on June 26. On April 17, the AWS DeepRacer League will hold three AWS Summit races, on three different continents, all on one day. The Summits offer the opportunity to get hands-on with AWS DeepRacer. There will be multiple workshops and hours of live racing. You can register to attend now, and follow the action live on the day at www.deepracerleague.com. Coming soon is the AWS DeepRacer Virtual League. Get your first model ready today by taking the digital training course for reinforcement learning and AWS DeepRacer. Developers, start your engines! Your journey to becoming a machine learning developer begins with the AWS DeepRacer League.